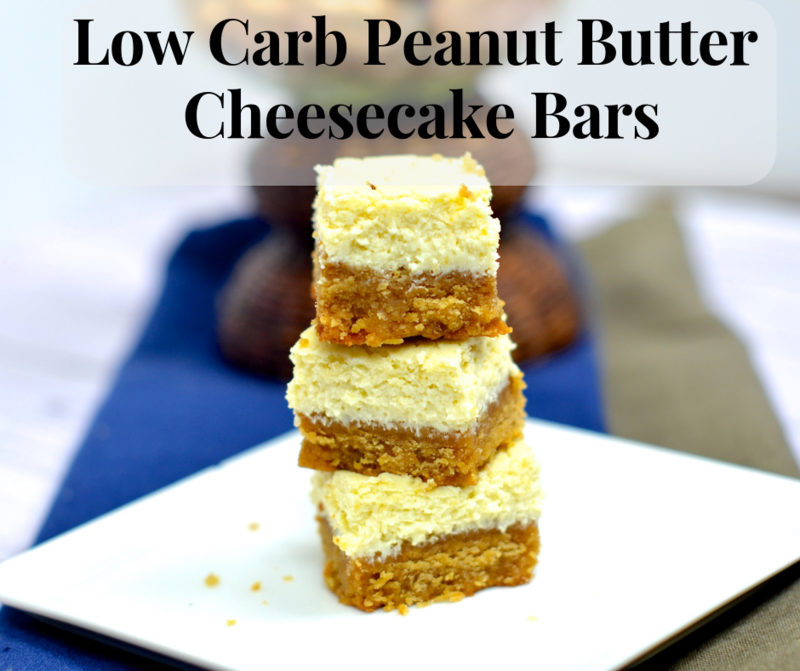 With only 5 ingredients, these low carb peanut butter cheesecake bars will make the entire family sing with delight! QUESTION TIME: Who loves cheesecake? I must be honest – cheesecake is my ultimate dessert indulgence. If I am celebrating a birthday or having a date night at a restaurant, my eyes go directly to the dessert menu. I past the chocolate cake and tiramisu and look for the cheesecake selections. 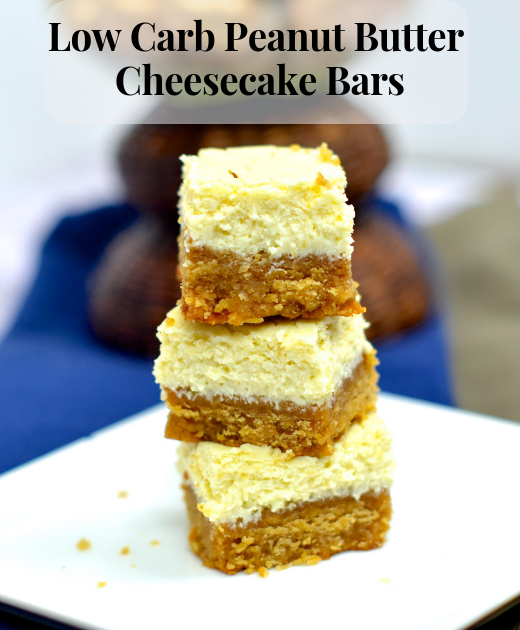 Trust me, I am not just stuck on the dessert menu, I love basic no bake style cheesecakes and amazing full baked from scratch cheesecakes. Simply put, I love the creamy feel of this amazing dessert dish. The best part about my love of cheesecake? Mr. 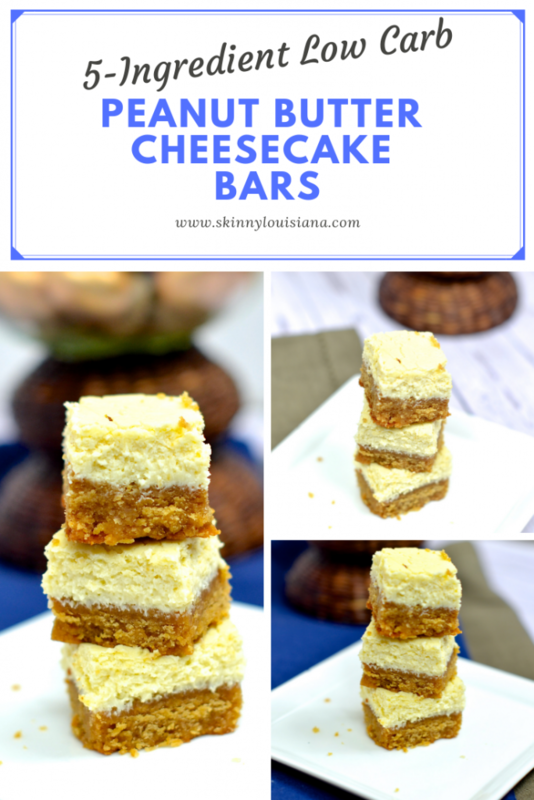 Skinny Louisiana also shares my love of cheesecake AND my sweet daughter loves this dessert. Anytime I am making a dessert in the Skinny Louisiana kitchen, she will say ‘Is this a cheesecake momma?’ (Christian – my son – does not share the love of cheesecake.) 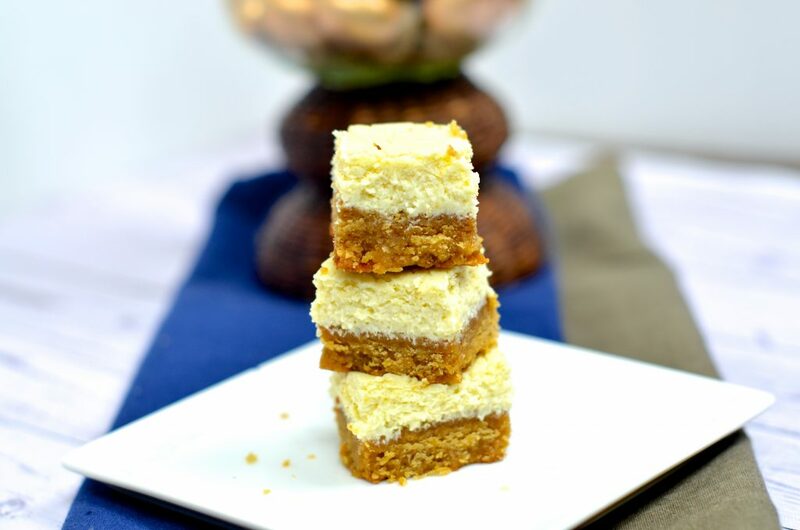 She especially loves our Low Carb King Cake Cheesecake Bars. Yes, I realize cheesecake is full of carbs, sugar, and carbs, and it is time to take this classic dessert to the drawing board and give it a low carb, Skinny Louisiana makeover. The result is an amazing low carb, keto friendly (see modifications below) dessert you and the family are sure to love. Not all peanut butters are equal! While many of us love peanut butter as a snack, we have to be very careful in the type we select. Many of our peanut butters have added sugars (think of those fun flavors we see at the store). Take a look at the label and compare looking for a product with no added sugar. For a keto friendly dish, use almond butter, again, still double check those labels. We love eggs in the Skinny Louisiana kitchen. Eggs offer us an amazing source of protein with zero carbs. Line 9 x 5 loaf pan with non stick aluminum foil. Grab 2 bowls and your hand mixer. In one bowl, combine peanut butter (or almond butter for keto), Swerve granular sugar, vanilla extract, and 1 egg. Beat with a hand mixer for 2 minutes. Place aside. In a separate bowl, combine light cream cheese (or full fat for keto), Swerve granular sugar, egg, and vanilla extract. Beat with a hand mixer for 2 minutes. Spray pan with non stick cooking spray (yes, I still spray even though I line with non stick aluminum foil. Pour peanut butter layer. NOTE – this will be thick. Run butter knife or spatula under hot water and use to evenly spread peanut butter layer. Once evenly spread, layer cream cheese filling on top. Place pan in oven. Bake for 30-40 minutes. Remove from oven. 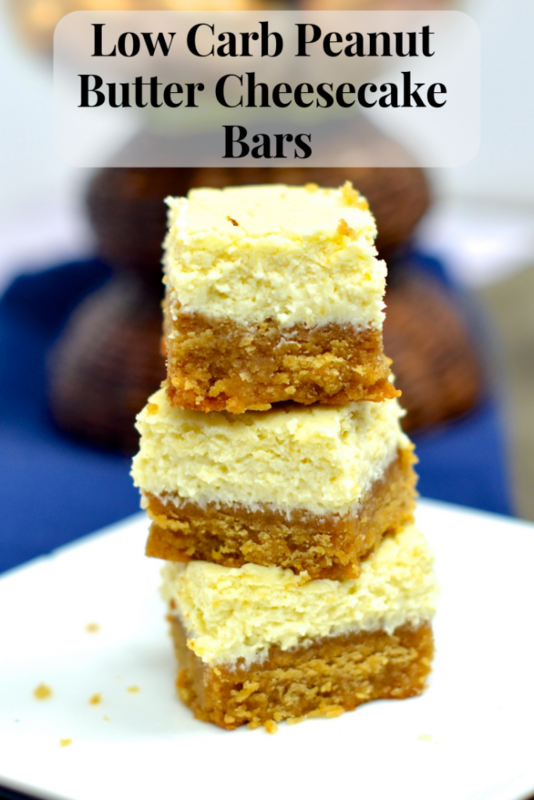 Cut into small bars. In a medium sized bowl, combine peanut butter (or almond butter for keto), Swerve granular sugar, vanilla extract, and 1 egg. Beat with a hand mixer for 2 minutes. Place aside. In a separate medium sized bowl, combine light cream cheese (or full fat for keto), Swerve granular sugar, egg, and vanilla extract. Beat with a hand mixer for 2 minutes. Place aside. Spray pan with non stick cooking spray. Pour peanut butter layer in pan. Spread evenly. 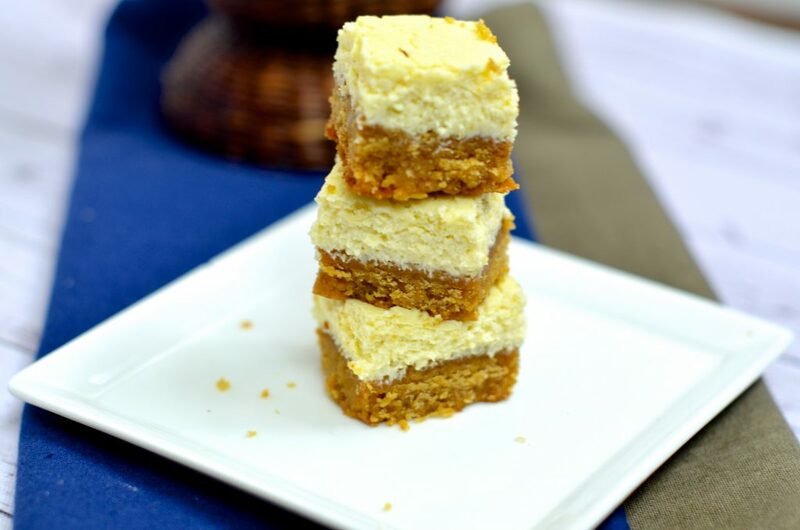 Layer cream cheese filling on top. Spread evenly. Calories: 120, Total fat: 10g. Saturated fat: 3g, Cholesterol: 25mg, Sodium: 55mg, Total carbs: 4g, Sugar: 2g, Fiber: <1g, Protein: 5g.